Fawlty Towers fans, and great lovers of comedy, brace yourselves for the very best in the "Full fat" interactive Fawlty Towers experience! 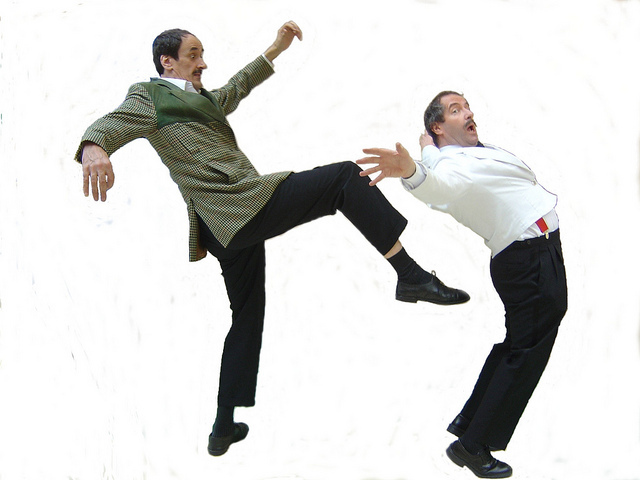 Fawlty Towers theme night at a venue of your choice, provided by the John Cleese impersonator, Edmond Wells, the only 6' 7" Basil Fawlty impersonator who is the same height, walks the walk, and talks the talk: "You know, you really do look like me." Quote from John Cleese. Comes complete with the Fawlty Towers team of Manuel and Sybil. As seen on ITV- "Will the Real Basil Fawlty Stand Up!" Also "Four Weddings," and more recently, the BBC Television Centre leaving party. Typically the Fawlty Towers theme night will start with meeting and greeting the guests at reception. Also excellent for ice breaking at 70's theme nights.Basil will announce dinner and have Manuel lead the guests to the tables in time honoured fashion, with an alternative "FIRE" sketch if suitable, complete with alarm and CO2 extinguisher. (Works a lot quicker than any Toastmaster)! Sybil will be wading her way through her second vat of wine, and making herself available to just about anyone.... Manuel will feature as a waste of space, whilst Basil will be giving the sort of service one would expect from a Top Class Torquay Hotelier, all without mentioning the war! Around 80 % of the work will be interactive with guests at the tables. Numerous props and routines available, tailored to suit private or public events and the venue. 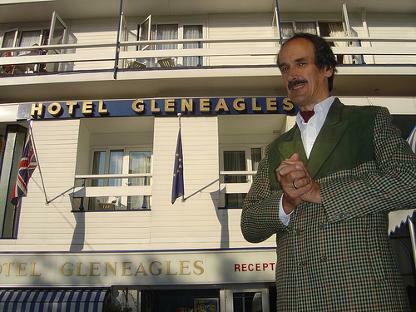 All honed to perfection, with excellent timing and track record, in 17 countries over the past 19 years, inspired by the genius of John Cleese, and his stay at the Hotel Gleneagles Torquay, as below. Contact Ed Today for Availability, Queries, and a Quotation.